FORT MYERS, Fla. AP – Florida Urban Organics occupies less than an acre on the industrial outskirts of downtown Fort Myers. The farm’s neighbors include a scrap-metal recycling center and an auto body shop. A granite store sits in front of its aquaponics greenhouse. Leafy tiers of hydroponically grown lettuces – green butter, Cherokee, green oakleaf – stretch along Metro Parkway, south of the railroad tracks. “They must have just changed out the McDonald’s sign,” Tom Winrow, director of business development, said, pointing to a billboard jutting from a rectangle of soil soon to be planted with root vegetables. “Talk about ironic.”Last month, less than two years after taking root here, Florida Urban Organics and its parent company Selovita earned a one-of-a-kind distinction. The farm, already certified organic by the U.S. Department or Agriculture, became the first aquaponics/hydroponics facility ever to be GlobalG.A.P. Certified, an honor awarded to growers that maintain stringent standards of food safety, sustainability and environmental stewardship. While this urban facility is part farm – its first lettuce harvest of the season took place Monday morning for delivery to area restaurants and grocers – its mission is research and development. This for-profit company hopes to create new methods of agriculture. Methods that could revolutionize the way food is grown. Gary Winrow isn’t a farmer, never has been. During his first working life he developed local real estate and drilled wells to recover groundwater. In his semi-retirement he started pondering the issues of food security. He had ideas. His ideas needed testing. “It became clear to us that developing a proof of concept was needed,” Winrow said. So he secured a group of local investors and, in January 2013, took over a warehouse that had once housed a builder, and a beer distributor before that. Flats of microgreens and pea tendrils grow where kegs of Miller Lite once awaited delivery. 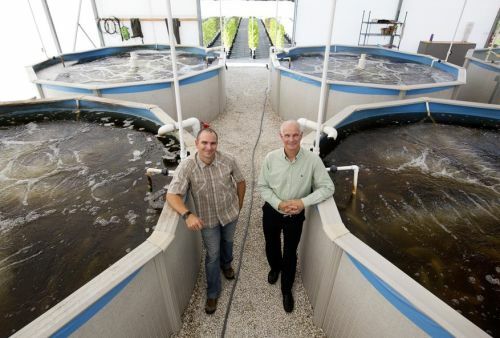 Tanks of tilapia bubble in what used to be a parking lot.Winrow, with the help of his son, former professional baseball player and Bishop Verot High grad Tom Winrow, assembled a team of engineers, farmers and microbiologists. Their goal: Find a better way. “It’s exciting to see something come together that could help urban cities grow their own crops,” said Valerie Vivian-Rogers, the lead microbiologist and quality control manager who spearheaded Selovita’s 10-month GlobalG.A.P. certification process. Read the full story via In Fort Myers, organic farming methods take root – Washington Times.